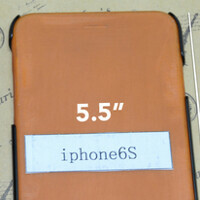 Case leak reveals dimensions for 5.5 inch Apple iPhone phablet? Out of France comes one of the first looks at a leak involving the large-screened Apple iPhone phablet. The device is actually called the Apple iPhone 6s according to the leak, which is based on a pair of cases allegedly designed for the Apple iPhone 6 and its large-screened brother. While the iPhone 6 case measures 138mm x 67mm, the iPhone 6s case shows dimensions of 157mm x 81mm. That is pretty much in line with the Nokia Lumia 1520. That 6 inch phablet is 162.8mm x 85.4mm). The thickness of both devices would appear to be 7mm. That would allow both models to be thinner than the 7.6mm Apple iPhone 5s. Making the iPhone phablet so thin might make for a great looking handset, but it is making it hard for Apple to find a supplier for the kind of thin battery cell that the model requires. While there have been various rumors as to when the iPhone phablet will launch, with some speculation that the phone won't see the light of day until next year, the latest rumor is that the 5.5 inch version of Apple's smartphone will be released in September. There has been plenty of talk that Apple was planning on launching a 4.7" and a 5.5" phone this year. Have you been under a rock? Apple has mentioned on various occasions that their explicit idea of what a smartphone should be is a one-handed device. To go completely against this notion is a bit far-fetched, regardless of what rumors say. Just like how the rumors of the iPhone 5 said that it was going to be a Teardrop design (and cases were made accordingly). The Phaggots over at BGR have been laughing at the phablets since they came out.. Now the same phaggots at bgr are crying about the new iphone not coming out soon enough... BGR BULLSH!t Garbage Regurgitated..
Its crazy that they are going so big. Their specialty is small phones. Samsung and android in general have the big phones and phablet markets cornered. They are going to lose more market share being that im almost certain Android phones will provide better specs overall. This leaves the door open for Android to pentrate with smaller phone offerings with great specs if Apple moves away from the 4 inch screens. I'm just curious what all the people that said they couldn't use a Nexus 5 or Note because they were too big are going to do now? I guess they will just have to stick with the 5S? That or they'll suddenly be able adapt to a large phone now that it has a different logo on the back. No one said these would be the only sizes available for the new phone. No doubt, I imagine they've a boat load of four inch phones to unload yet before going big permanently. They'd lose too much moola to abandon four inches any time soon, they can wring a few bucks out of them yet. No one has said or leaked a new 4 inch version either. Case makers would needs mocks of those so I see not reason why they wouldn't be leaked just like the one in this story. All reports note a 4.7 inch iPhone 6 and PA posted something a week ago about Apple burning through 4 inch inventory in preparation for the new model. They are still selling the iPhone 4 today so they could just sell the 5S and 5C for the next three years as their iPhone Mini. Now I think a 5.5 iPhablet can be somewhat intriguing but based off of how they do bezels... That will be a massive phone with how they do bezels. Those bezels need to shrink tremendously. I'm glad they are pushing out bigger phones... I'm sick of hearing Apple user complaining how small iPhones are. hey! apple! it's 2014! welcome to 4" display! better late then never you say? What phone do you use, out of curiousity. They had 4" since iPhone 5. Oh no! hope the back is better than this BullS**t i been seeing. Guess what I'm getting? Camp out time. Because he is excited in purchasing the new iPhone makes him a child? Let me tell you this. Samsung is doing something wrong since they never have and never will generate a crowd and fan base as strong as Apples. For a company to make their customers camp out in line, they're doing something right. PS4, Apple's iPhone, the Call of Duty games, World of Warcraft, and other great successful products. That takes a degree of success to make your customers fall in absolute LOVE. Explains why Samsung was sneaking around hiring random people to be undercover during the iPhone 5s launch. Luke wants to learn from Yoda. im happy that apple make the decision for 5.5 phablet, even when i totally love android phones...)..
All they need to do on the "6s" is add a micro sd slot that has a cover like the micro-sim tray and they'll finally have a device that can truly compete with android phones.